In the same way as the Sunday chamber concerts at the court of Louis XIV, enjoy the luxury of a private concert. Comfortably lying on a mattress with built-in speakers, discover the vibroacoustic therapy: a real unique musical massage which allows you to relieve your tensions. Experience a deep relaxation and let yourself be surprised by these vibrations that will not only boost your energy but also expand your body consciousness. A new and original way to take care of yourself! Plenitude and relaxation will be at the rendezvous of these musical treatments at Sérénité Sonore. Events focusing on the music and health equation are organized on a seasonal basis, offering you a unique experience in which music reinforces the benefits of the care provided. In small groups of 6 people, you will first be welcomed with a healthy appetizer accompanied by a refreshing beverage, then you will be invited to sit on the massage tables in front of the stage. 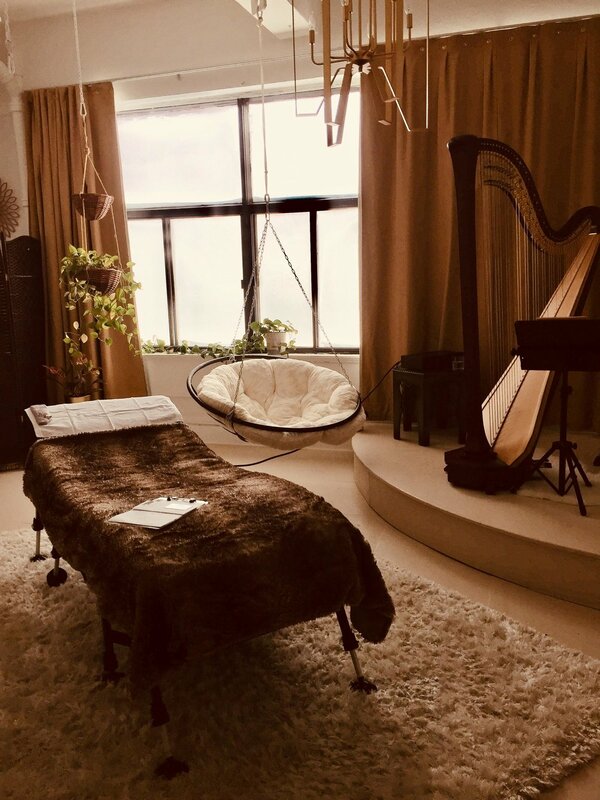 You will experience a concert lying on your massage table while receiving the care of a massage therapy session (Californian approach, lomi lomi and polarity) or of acupuncture. The ultimate way to stimulate all your senses!